Some players may not want to wade through the whole walkthrough, just to find the solution to one troublesome spot. Therefore, you may click on a link to jump to the desired area. The interface: The cursor changes to a pointy arrow when you can interact with something. To examine it, right-click, and to either pick up, operate, or open something. left-click. The navigation arrows are obvious, as are the conversation icons. This game is not suitable for young children or very squeamish adults. It contains frequent references to murder and occasional references to cannibalism. Explicit graphic images of violent acts may frighten or offend some people. A word about installation and game options: If you have room, I strongly recommend the following procedure: Open "My Computer" and navigate through the following folders: C:, Program Files, House of Tales, Mystery of the Druids. If you are in the correct folder, you will see a savegame folder, an updates folder, and several files. Right-click on the background and select New >Folder. Name it Disk1 (without a space). Do that again, naming a new folder Disk2. Now, depending on how much room you have - put the disk labeled "The Present" in the CD-ROM, and copy the entire disk into the Disk1 folder; then put the disk labeled "The Past" in and copy it into the Disk2 folder. If you are short of space (each disk will take up about 600 megabytes) just do the Present for now. When you finish the Present section of the game, you will not need to return to it, and you can delete the Disk 1 folder and fill the Disk2 one. If you have the capacity to copy both disks, you will have a smooth transition from present to past. The improvement in performance is well worth the effort of doing this. When you start, you will be given the option of setting your video to either Best Quality or Best Performance. You should select Best Performance unless you have a very high-end very fast machine. The difference in quality is barely noticeable, but the difference in performance is substantial. For detailed instructions on the full install, Click Here. For a printable walkthrough, Click Here. Chief Miller is in a pretty bad mood. It seems Detective Lowry investigated a series of murders, resulting in the arrest and conviction of a 50-year-old butcher. Now, there has been another killing, apparently by the same man, thus the butcher, serving a life sentence, must have been innocent after all. Chief gives you the case file (which you have a paper copy of in the diskette case.) It contains some important background, and some autopsy reports that are not aimed at the squeamish. Before you leave Chief's office, take the matches from the desk in front of you. Go check out your own (Halligan's) office. It's the room to the right of the Coke machine. We won't criticize the housekeeping, will we? Poke around. Find the drawers you can open, and take everything that you can. Apple juice, evidence bags, a green rag, and the gloves. Time to go to work. Leave the building and go to . . .
Talk to the Bobby standing guard, and learn what you can from him. Then go examine the crime scene itself. Use the evidence bag to collect a bone, the largest one just below the rib cage. Use another bag to pick up some burnt grass, just below the foot-bones. Back at the Yard, find the Forensics Laboratory. It's across the hall from Chief's office. Talk to the technician, show him your evidence, keep conversing with him until he suggests you see Dr. Turner. The museum is under renovation and closed for the duration. Let's check out the phone booth to the right of the entrance-gate. You can lift the receiver, but there's no dial-tone. Public phones take money, don'tcha know, and it seems that last Pepperoni Pizza cleaned out our pockets. We'll have to find a few coins somewhere. Go talk to the beggar to the left of the gate. He has some change in his hat, but - nawww - we couldn't do anything like that - not while he's awake anyhow. What were you thinking? So, talk to him, find out how very thirsty he is, and take the empty flask. Back to the lab. Go to the rear of the laboratory and examine the items on the shelves. Over on the right there is one odd-looking container that isn't a jar of liquid. Take it. Go look at the other shelves on the left. Examine things to see how not-clean they are. Polish them up with the green cloth. We need a way to find out which one is safe to ingest. Talk to Chris about drinking the stuff until he decides to let you try. Watch out, lab alcohol is about 180 proof, and nearly tasteless. (Don't ask me how I know.) And it's got a kick like a mule with PMS. Ooooops! Guess we should have been a little more conservative there. Anyway, Chris is gone, even if the hangover is not. Go the the bottles you previously cleaned, and use the fingerprint powder to decide which one he touched. Take it, put some into the flask, dilute it with apple juice, return the bottle, and go see the beggar. Give the beggar a snort of your home-made applejack. My, that stuff is relaxing! Time to put your conscience aside for the public good. Scarf the poor bugger's few coins and vamoose. Go to the phone, lift the receiver, open the phone book, and put a coin in the slot. You are expecting Dr. Turner, but some woman answers instead. A secretary maybe? She's rather abrupt with you, and the good Doctor won't be back for several weeks. Return to the laboratory, and talk with Chris. He informs you that the woman is Melanie, Dr. Turner's daughter. Go back to the phone booth, call her again, and in the course of the conversation, she agrees to see you in the Museum. Go meet with her and tell her everything you can. When the conversation ends, you are now playing as Melanie. Examine everywhere in the lab. Find the Microtome (scraper) and place the bone on it to create a thin-section. Put the shaving into the microscope, and focus by clicking the knob forward several times. When it becomes clear, you can see a fleck of gold. Look at the table with weapons. The sickle at the bottom stands out from the rest of the implements. Use the large bone on it to discover that the nicks match the shape of the sickle. Read the articles about historic Britain and past Druid activities. Tell Halligan what you have learned. Tell him about Arthur Blake. Restored to your former scintillating self, you suppress the urge for a pizza, and head for Blake's house. Speak with Mr. Blake about everything you can. You will learn about Druids, the Amulet of transformation. More than you ever wanted to know, really. Head to Portsmouth and Ride the ferry to France. Try speaking with the Ferry-boat captain. He doesn't seem to have much to say. Let's see if the fisherman will be more cooperative. Well he is, sort of, if we keep the volume down, that is. Talk with him about everything. Your purpose here is to learn the captain's full name, which will encourage him to be more sociable. If the fisherman doesn't tell you the captain's name right off, keep nagging him until he does. Addressing the Captain by his proper title does the trick. He becomes a regular Chatty-Cathy. Listen to his stories, and encourage talk of Druids. Find out that salt is able to bring down their buildings. Look down at the water-line of the boat and discover some salt sticking there. It probably would be a good idea to have some salt, just in case. This would be a nice time to save your game. Talk to the fisherman again, and learn that they are old drinking pals, but the captain's cat can be a nuisance. Now, you see a plan starting to come together. If you can get the cat to help you, the fisherman's equipment might come in handy. He is unwilling to either loan or sell it. 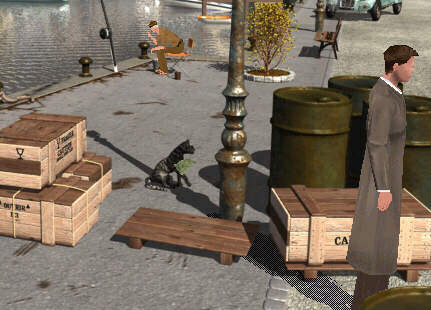 After you talk with the fisherman about the Captain, and you learn that the Captain's cat is a nuisance, you will see the cat each time you back away from a conversation with Pierre. To bag the cat, you must stay out of the way, because the cat is shy. Stand next to the crate labeled Carmors, wait until you see the cat walk from left to right, and stop behind the two other crates. Wait some more, but have the green cloth ready, the one you took from your office. When the cat moves again, and stops for a moment, use the green cloth on the cat. Go back to the fisherman's area and let the cat go. She knocks the bait into the water, and the fisherman grudgingly leaves to buy more bait. He trusts you to watch his precious rod and reel. He never met that beggar, apparently. So if you take the rod, and take the bucket, they can be combined to create a salt-scraper. Go to the boat and fetch-a-pail-of-salt. (On your map it's called Schloss Carmors, in German.) Make your way around the far left side and find the locked gate. You don't have the key, but you can slip the lock with the file-folder Chief gave you. Look at the headstones until you find one with a hollow spot on top. Put the salt there and grind it to a fine powder with the bone. Take the salt with you, and go around to the Mausoleum. Add a pinch of salt - and Whoosh! Down comes three thousand years of history. A charming little treasure-chest is revealed. Oooh! Oooh! it contains the Amulet of Transformation. How could we be so lucky so early-on in the game? Let's get on that boat and head home with the good news. Arthur Blake will be just thrilled! By the way, who was that sneaky chap hiding behind a crypt? Could it be we're being watched? Myself, I like a little fresh air during a channel-crossing. Try stepping outside, though, and you decide to hide the amulet, rather than take a chance of losing it topside. Open the flap on the bottom of the ventilation shaft and hide the amulet. Nobody would ever think to look there. Out to check on the seagulls. Uh-Oh! Coming back, we find somebody ransacked the place. And what's more, they looked in the shaft. That's just what we're going to get - the Shaft! Let's go face Mr. Blake. He accepts the bad news graciously, almost as if he expected as much. He goes on to explain Neo-Druids and "The Circle." That wasn't so painful. Time to face the boss. Well, if Mr. Blake was genteel, the Chief certainly isn't. He heard how you clipped the beggar, (never admit to anything) and thinks you're wasting the department's time fooling around with all this hocus-pocus stuff. Well, if we're going to make any headway at all, we need more information. Go see Janet in the Records Room. That's to the left of the Coke machine. If you happened to ask the Chief for permission to access the data, you were told in no uncertain terms that you should do your investigating the old-fashioned way - with your feet! Nuts to that idea. We need efficiency, and we need it now. Janet won't let you into the system either, because you need a signed form. Pick up a form and try to get the Chief to sign it. No Way. We'll have to blind-side him somehow. Go to Records and get a clipboard, a piece of carbon-paper, and a form to request stationery. While you are right there, read the notice on the pin-board from the Chief. If we assemble these items correctly, the chief should approve our request for stationery, and unwittingly produce a signed data-request at the same time. Great scheme, but the carbon-paper sticks out and he would notice. Got to trim it somehow. Let's see, who might have a pair of scissors? Finding such a thing in your own office would be hopeless, it's such a mess. Go there anyway, just to check on things. Your answering machine is blinking. The top arrow plays a message (you have six) and the other two arrows cycle up and down through them. Think hard about message number five from the Chief. It just might be useful. Go talk to Lowry. The way to get him out of the office so you could "borrow" his scissors would be to phone him up and scare him out of the room. Talk to him everything, but especially about dating Janet. Insult him: "I'd like to know . . ."
"Well, I would have thought . . ."
Keep it up until you get the option to get help with the copier or use his phone. Ask to use the phone. If the choice to use his phone does not appear, go back to your office, pick up the receiver; "No, I'd rather use the speaker - phone;" try to dial a number and notice the missing dial tone. Now the conversation with Lowry will include a reference to the phone. Keep at him until he gives you his extension number, 196. Go to your office and use the speaker-phone button to call ext. 196. Play message 5, and Lowry dashes out of his precious office, leaving it all to you. Get the scissors, snip off the excess carbon, and go directly to the Chief. If Lowry's still in there getting chewed out, go somewhere. Your office, the lab, Janet's, it matters not. When you come back, you can enter. Give the Chief the stationery form to sign. Make your way out, and go to Janet. She still wants a request for data form signed by the Chief himself. Give her the ersatz form, and ask for information on the Circle. She digs into the archives, finds about Lord Sinclair, a murder, and other things. When she is finished, ask for a printout. Take the printout from the printer and go into the hallway and make a copy. Go to the museum and put the copy into the letterbox in order that Ms Turner will know where we are. Now that's some ritzy cottage! Try the doorbell. No matter what we say to the butler, there's no getting inside, at least the normal way. Go around to the right side and examine the fence. Perhaps we can find a way through there. Trying the scissors, the wire is too heavy. Go around the left side and notice some cut grass. It's dry. Talk to the gardener at length to learn about the grounds and their owner. Maybe we could distract the gardener and take his tools. Set fire to the dry grass (with the matches you took from the Chief, remember?) and you will have access to the garden shears. Go back to the right-side fence, clip the hedge, and cut the heavy wires. Ooops, the shears broke. The scissors will take care of the light-weight wire. Ooops, the scissors broke. Don't touch the fence directly, it's electrified. Use the gloves to widen the hole. Now it needs insulation so you can crawl through. Combine the scarf with a plastic bag to protect from electric shock. Before you go through the hole, be sure to pick up the piece of wire that fell to the ground. Slide through and meet Jack, who introduces you to Lord Sinclair. You are invited to dinner, like it or not. You are locked in your room. How to get out? The door is locked, the wardrobe is locked, the window is locked. Examine the large painting over the bed. Ugghh! Left-click on it, and night falls. Left click on the paintint again and take it down. Use the frame to pry out the nail. Use the nail to remove the canvas. Notice the slit under the door. Notice the dark keyhole. Maybe we could retrieve the key by dropping it onto something thin and flat. The canvas won't fit through the slit. Take the nail and pry up a couple of tiles. Now the canvas fits. Use the nail to push the key out, and pull it back under the door. You are free! Go downstairs and into the dining room. Examine the pictures on the wall, especially the one close to the table, which resembles the symbol on the Amulet of Transformation (It's the Druid symbol for fire.) Go out the back door, and a long cutscene ensues, where you observe a gruesome Druid ritual, then join the Circle at dinner. You become one of them. Then Melanie Turner reads your note and decides to check up on you. The butler never wavers. There's no use pursuing that route. Go around to the right and crawl through the hole Halligan made. Hide behind the first bush. The rocks go to your inventory automatically. Put them into your hand. This is an ESSENTIAL time to save your game. Do it! Go to the weird picture and slide it to reveal a safe. The combination is deduced from the painting. The ten o'clock, one o'clock and six o'clock positions appear to be important. Try clicking the rectangular button. Listen to the sound. Now turn the combination to 10. Press the button and notice the slight difference. That is the first digit. Then one, click; six, click. The safe opens and you receive a parchment covered with runic writing, and the Amulet of Transformation. Uh-Oh. The door rattles. In comes Brent Halligan. He is just not himself. (Shall we say he's been "off his feed?") A very long cutscene ensues, ending with a conversation at Mr. Blake's. Continue talking with him until he mentions the need for a book: "Celtic Orthographic Systems" by Scott M. Winfield. You will go to the Oxford Library to find it. How can we get this book out? She won't let it be circulated. Aha! Back to those Roman-coin books, and borrow one of the dust-covers. It fits well enough, and that title can be borrowed. Check it out, you've hit her field of interest. She turns as nicey-nice as she was nasty before. Let's give it to Mr. Blake. Take the book to Arthur Blake and let him translate the parchment for you. Talk with him and Melanie, who seems a bit over-protective at the moment. Suddenly, in the midst of the conversation, a tremor begins, frightening you into leaving. The house is struck by a shell, or a bolt of magic or something, and erupts in flames. Blake is lost. We have nothing left to do but head for twelve-bridges and try to save the world . . . . WORLDS! Have some conversation but don't get too-too personal. After all, we are professionals. Go look at the Caution sign, and take the boards with you. Head up the only available bridge, the one that appears to be in the best repair. Use a board to create a temporary bridge. Use the other board to step forward. Keep cycling the boards until you get to the other side. Melanie will follow, barely escaping the ultimate collapse. There's no going back now. Have a look at those scales. That mechanism should lift the door, if we can find the correct weight. Do we have anything that might weight more than it looks? Something magical perhaps? Put the amulet in the tub and up it goes. You can't just walk in and leave the amulet behind however, you need to prop up the door so you can take it with you. Use the remaining board to hold up the door. Crouching down, you and Melanie go inside and look around. More Druid symbols on the floor, (notice the sequence!) and another tub. Go back outside to the scale and remove the screw on the left side, taking it and the heavy hook with you. Then go into the tower and pull the wooden board out from under the door, allowing the tub and hourglass to rise. Look closely at the hourglass, and remove the screw, using the broken scissors. Put the hook into the square opening, and enjoy the scene! You arrive, seemingly where you left off, at the Gate of the Worlds. Upon looking outside, however, the bridges appear intact, nearly new. Some soldiers approach. Ooops, they are not so friendly. Melanie finds herself in a medieval kitchen. Look to the far right for a cookbook. Read the recipes. Go into the dining room and talk with the soldiers. They believe you are a Danish spy preparing for an invasion of England. No wonder they're unfriendly. Go back to the kitchen, then return to the dining room. It's payday, and the mood has greatly improved. They mention one-ounce pieces of silver. An ounce-weight could be useful. Talk with them, offering to make a love-potion, and compliment them on their equipment. Then, as the soldier is more relaxed, take a coin from the pouch hanging from the back of his chair. Find it just under his elbow as he drinks. Back to the kitchen, wench! They are expecting a love-potion, but would seem prudent to concoct a sleeping drink instead. Go to the shelves at the left of the fireplace and take a copper scale-pan from the bottom shelf. Put it on the scale. From the middle shelf you can pick up several herbs. Right-click in your inventory to get a description of each one. From left to right: menthol, unknown leaves, cinnamon, fleshy leaves, anise, and spongy leaves. Well, that's not much help, the recipe calls for crimson (red) and other colors. We will have to test the herbs to see what color they turn when wet. On the table by the door is a wooden bowl. Take it and use it to scoop water from the cauldron. Don't you just love it? She puts a bowl of boiling water in her pocket! What will they think of next? Anyway, go to the scale and put the coin in the right side. Choose an herb, crush an ounce of it (put it in the weighing-pan, that is) and put it back. Then, in inventory, put the crushed herb into the water bowl to learn what color it becomes. The recipe says one ounce crimson, one of golden, and two of ounce and ounce makes green. We find out that there is no green herb, but we know that blue and yellow create green; thus another yellow and one blue would do the job. Here's the colors: Menthol=white; Unknown=yellow; Cinnamon=red; Fleshy=light brown; Anise=blue; and Spongy=violet. Crushing and adding one ounce at a time, it calls for two cinnamon, two unknown, and one anise. There, the water turns clear. Time to feed the boys. They get groggy, but do not sleep. Go to the kitchen for a moment, and return to find them passed out. Take the key from the blond fellow. You can look at the left-hand end of the room if you like, but the exit is locked. Go down the cellar stairs to find Brent whining in his cell. (I'd whine too, if I was counting rats while you are brewing love potions; Jeez!) Let him out. If you tried the key upstairs, you know it's the wrong one. Go left, to the big crates. They're heavy for one, but the two of you are up to the job. Find the secret exit and proceed. It looks like a maze, but don't worry. Just proceed, following Brent's voice until "Groan . . ." You are seized, not to be seen as Melanie for a while. Halligan wakes up in the monastery. Looking around, there is a yoke on the floor (no thanks), a bed, and a great view. Turning away from the view, we are greeted by Brother Maglor. He is friendly, it seems, and informs us that our arrival was expected, and that it's our responsibility to save the world . . . WORLDS! Serstan is the bad guy, and all the things Blake warned about are true, and we are in the thick of it. We will have the run of the place, that is, until the day of our execution. Huh? Execution? Nobody said that was part of the deal. Seems we need to find the room with the crystal ball and pronto. The first room on the left (Halligan's right) is Brother Maglor's. Go in and talk to him as much as possible. Serstan has perfected the ritual and must be stopped. It will take place at Stonehenge, only 2 days and six hours from now. We are probably "honored guests," if you get my drift. The next room is a storehouse for foodstuffs. Mind the rats! Next view down shows three doors. The one on the right has books on a table, and the fire's out. The middle door is not accessible, and the one up the steps leads to a mysterious room with a huge portal, barred and locked. Go back out and around the corner by your room. The first door on the right (right on the screen; H's left) goes outside to the interior courtyard you saw out the window. Go right (H's left), and visit the blacksmith. Talk to him about everything, including his village, and unusual things happening. Look around the back of the shop and see the shield with the same symbol; wavy lines and an X. We have figured out by now the X is two logs; the wavy lines show them burning.) Outside, look at the other side of the shop and see the chimney blocked by a bird's nest. No wonder the fire doesn't burn. Go back and investigate the other end of the courtyard. There is a garden, a drain, a rusty pipe, further on there are stables, hay and a pitchfork, a cistern full of water, and a valve. I feel a plan coming on, but what to do? Time will tell, I'm sure. Go back inside. Across the hall is a large double door. Look in, and find a large conference-table, complete with familiar signs (again, notice the sequence.) At the far end is a device like a slide rule. The small door leads into the library. Guess who's been doing her homework? Melanie convinces us that she is doing the right thing, and persuades us to keep looking around. Next door is the kitchen. Eeek! Mind the rats! Over on the right sideboard is an iron crucible. Take it. Over on the other side of the room, past the stove, is a table with some herbs. Take them. See the hatch to the dining room? You can open and close it. You can also open and close it from the other side, which is obviously the next room. There is someone sitting there, but he does not talk to us. The next room is Serstan's. Enter and talk with him, You will find you just how imperious he is. He kicks you out. Next room, the fire's working, but little else to do. Next, you will find the candelry. Take some candles and go back to the room with the working fire. Place the crucible on the fire, then the candles in the crucible. You have a block of wax. Go back outside to the garden. Put the herbs on the drain, blocking it. Turn the valve on the rusty pipe. Then go all the way back to the cistern and open the valve, letting the water flood the garden and drive some earthworms out of the soil. Take the worms. Go to the far side of the Smithy's shop and climb up to the roof. Put the worms on the roof, luring the crow away from her nest. Pull down the nest, allowing the fire to work properly. Speak to the smith. He is grateful, sort of. He might help someday. Go around back of the shop again, farther until you find a chopping block and axe. Take a chip of wood from the block. Go back inside and visit Serstan again. He throws you out. Visit him again and ask to watch. He doesn't care, as long as you don't touch anything. Notice the artwork: Three of the four pieces that you saw in Sinclair's house. The fourth painting Sinclair had showed the scene of the temples, same as the view out your bedroom window. Find the Secret compartment in the wall behind Serstan, just to the right of the window. Put the piece of wood in there. Now go visit Maglor and ask him for undisturbed access to Serstan's room. "That settles it. . " Grudgingly, he will try. Return to Serstan's empty room. 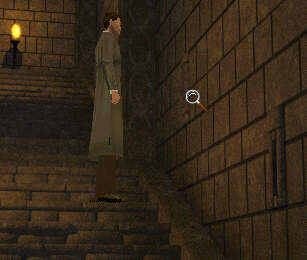 Serstan has closed the secret compartment with a block. Must be something valuable in there. You can pull out the block because the little piece of wood prevented its being seated properly. Take out the red chest and place it on the stool. Open the chest, take the key and make an impression in the wax. Put the key back, take the wood chip out of the hole, and replace the chest and block. You want the room to appear undisturbed. Go to the Blacksmith and convince him to make a key from the wax impression. It will take some time, so let's visit Melanie and see if she has learned anything. She has, but it's not much help. The main reason for seeing her is to allow the smithy enough time to cast the key. Go back and get the key. Make your way to the large doors that are locked and barred. Unlock both padlocks and remove the beam. Enter. Okay, does anyone hate mazes more than I do? This one's a real doozy! I cannot take credit for solving it. What makes it difficult is the fact that going back the way you seemingly came does not necessarily take you backwards. You can end up at a different location. In fact, the path you need to take actually has you stepping into the door you arrived at four times. The shortest path is only ten steps long, if you do it correctly. If you have the (insanity) patience, you could map the maze functions and figure it out, because each node is coded with a runic symbol. Probably they relate to the way the maze works, but I'll leave that up to the more intrepid player to discover. For the quick way through this mess, Click Here. Cross the open area and discover a stone wall decorated with relief carvings. Examine them. Turn around and close the wooden door, and the eye will open, revealing a tunnel. You have found the Crystal ball! Look into it. Huh? Stonehenge, but it should be intact, not in ruins. Evidently, the crystal ball is an Eye into Time. Look around the perimeter of the room. 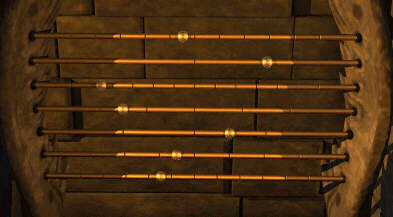 You find two rod-and-ball devices similar to the one in the conference room. One is whole, the other destroyed. Let's go back into the monastery. Maybe we can find Maglor and get some enlightenment. Look in the conference room. He is there, next to the Library door. He tells us that those devices are calendars, and that Serstan controls things by adjusting them. We learn that the current date is represented on the calendar in this room. Let's have a look. If this thing is a calendar, then the segmented bars must represent weeks, days, months, or whatever the Druid calendar was composed of. The top bar has 14 segments, the second 6, the third 4, the fourth 8, and the bottom one 12. The balls are set, from bottom to top, 5, 4, 3, 2, 1. That should be easy enough to remember. Go to the crystal ball room. Don't worry, the maze remains solved. Set the calendar to match the one upstairs, ignoring the two new rods that Serstan installed at the top. Start from the bottom and set them 5, 4, 3, 2, 1. Look in the crystal ball now. Apparently the calendar here controls the view in the crystal ball. Stonehenge is in good condition. Now set the calendar for the time of the ritual; two days from now, so slide the ball on the third rod (days) from one to three; the second one represents day and night, so it's already correct, and the top rod should be on six, for the hours. Need a picture? Click Here. Now look in the crystal ball again. Oh! Better go find Maglor and tell him what's up. Go to your room; he will find you. You talk, and Serstan decides to put an end to your antics. Take the bedsheet, make a hole in it with the candle, go to the window, and click on the temple in the distance. Geronimo! The makeshift parachute works remarkably well, given the circumstances. Unfortunately, Serstan hurls a magic bolt and hits Maglor in the back; you land in the stream and Maglor lands in the forest. Go back and find Maglor. He is badly injured, and when you convince him you can help, he suggests mistletoe. It's nearby, at the base of a tree behind some nettles. Use the gloves to part the nettles and grab the mistletoe. Too late. Maglor is gone. Take the gyro-top from his pocket and go into the Left Temple. Inside the entrance is a table with circular scratch marks. Use the top, and the cylinder opens. Go in, and it turns, depositing you in another area. Enter it again, and you see a column. Take the flint. Go up the stairs and take the scoop. Into the cylinder twice, and see a leather flask. You can't pick it up. Upstairs, take the small shovel. Into the roundabout twice, and on the column is a bowl of water. Use the scoop to take some. Upstairs is another flint. (you have one, you don't need two.) Two turns and find a bowl of earth. (The "Earth" looks like it's been through the horse. LOL!) Use the shovel to take some. Upstairs, take the bellows. Into the cylinder again, to the leather flask (four turns). Use the bellows to draw out the gaseous contents. It's Air, by the way. Into the roundabout until you come to the entrance, and leave the building. Go to the right temple. In the center of the temple is an altar, on which is a key you cannot take. It needs to be released somehow. Look in the individual rooms, starting with the one to the left of the entrance (H's right); proceeding counter-clockwise. The first room has a cage-like device with some straw in it. On the right side is a padlock. Close-up, it looks just like the Amulet of Transformation. Do you suppose? Yes, the amulet opens the lock. Open the cage, use your flint to strike a fire, take the torch from the wall above, and light the torch. Close the cage. Apply the torch to the grate below the basin to start the flame. Look out the window and see the megalith. Listen: It sounds faintly like fire out there, too. In the last room, the vessel has the symbol for earth. Open it and put in the earth sample. Light the fire, and see the megalith and again hear the wind blow. Hmmm: Fire and Earth can make Air? (gases?) You see the magic shield around the altar turn off. Go to the altar, take the key, unlock the blue door and proceed downstairs. On the way down, you will come across some "slits in the wall." They contain stone tiles with the elemental symbols on them. There will be eight tiles in all. Some of them are hard to see, as indicated in the photo. As a help, whenever there is one tile at a location, there is always another. Two sets look like this, and two are a different view, looking down. In that case, the easy - to - see ones are higher up, and the hard ones are just about shoulder - height. Gather all eight tiles and head into the chamber below. Take care: because of the stairs, your orientation is different. The elements are arranged in the same sequence as above, but whereas upstairs you entered between fire and earth, now you enter between earth and water. Look in one of the rooms. You will see a pedestal and a megalith. The object here is to distribute the tiles so that the pedestal receives a tile corresponding to the starting element as above; and the accompanying megaliths will receive a tile representing how the element is changed. So: the first one you come to counter-clockwise should be earth. Place an earth-tile on the pedestal and an air-tile in the stone. Then, in the next room, place fire in both. In the third room, use air on the pedestal and water in the megalith. Finally, water on the pedestal and air in the stone. The shield drops, and you can take the staff from the altar. Serstan comes in, with Melanie as hostage. You negotiate with Serstan, and insist that he swear on his honour that nothing will happen to either you or Melanie. Then, he begins the ritual, and sends you through the gate of the worlds to the present. Off to Stonehenge, then, for it must be time for the ritual at Sinclair's hands. Cruel as it may be, there is only one logical way to disrupt the proceedings. Serstan swore that nothing would happen, so conscience set aside, and for the good of the world. . .worlds; take your hedge-clippers and use them on Melanie. She dies; Serstan's vow is broken, and Sinclair falls victim to his own evil. The neo-Druids do not exist. Now are only problem is Melanie. Do we have any way to save her? Did we almost save Maglor? Hopefully, a thousand-year-old sprig of mistletoe will help. Ahhhhh! For a forum on Mystery of the Druids, Click Here. Just a quick note: when I arrived at the final scene, and Sinclair started to cut his throat, the game crashed. It was because I used the full install, and it did not include the final cutscene. If this happens to you, delete (or rename) the Disk2 folder, and replay the ending with the CD "The Past" in the drive. All images and concepts property of CDV Software Entertainment AG. You enter at a three-door gate. The blue glow is seen in the background. Take the Right doorway. Right, Center, Right, Right, Left, Left, Third, Center, Right, Right. The underlined instructions indicate that you turn and go back into the same door.